What should you do when you come up to a one-lane bridge? What should you do when you come up to a one-lane bridge? Even if you have priority on the bridge you must still give way to cars that are already crossing it. When you come up to a one-lane bridge you should slow down, be prepared to stop and only proceed if the bridge is clear of oncoming traffic. New Zealand has a large land mass and road network (over 94,000km of roads) and a small number of people to pay for roading infrastructure, so many bridges are one-lane only as they are much cheaper to build and maintain. In comparison, the UK has around 400,000km of roads for 64 million people. That's 1km for every 160 people. In New Zealand it's 1km for every 48 people! Generally, one-lane bridges are found only on quieter rural roads, but you will find some in seasonally busy roads such as the Thames-Coromandel coast road (SH25). 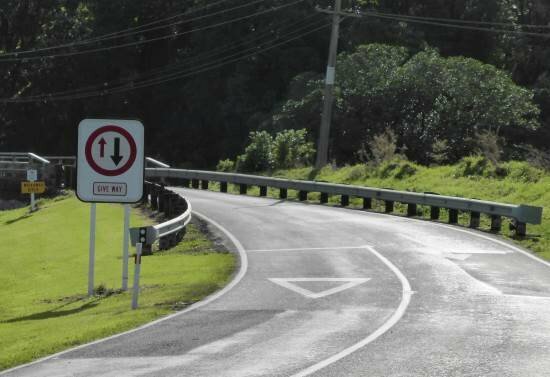 If you are a foreign tourist driving in New Zealand, be careful exiting the bridge as it's easy to momentarily forget that we drive on the left. You will need to exit the one-lane bridge into the left lane. One-lane bridges on common routes will have arrows painted on the roads at the exit. As well as the one-way bridge sign you may see 'One Lane Bridge' painted on the road on the approach. As the bridge will be narrower than the road, pay particular attention to the reflective markers on the left and right parapets. Wider vehicles such as campervans and cars towing boats and caravans should take special care. At the bridge above you don't have right of way. You must wait for other vehicles that are already on the bridge, or approaching and unable to stop. The white line after the triangle is where you should stop and wait.